Did our Earth have 2 Moons? 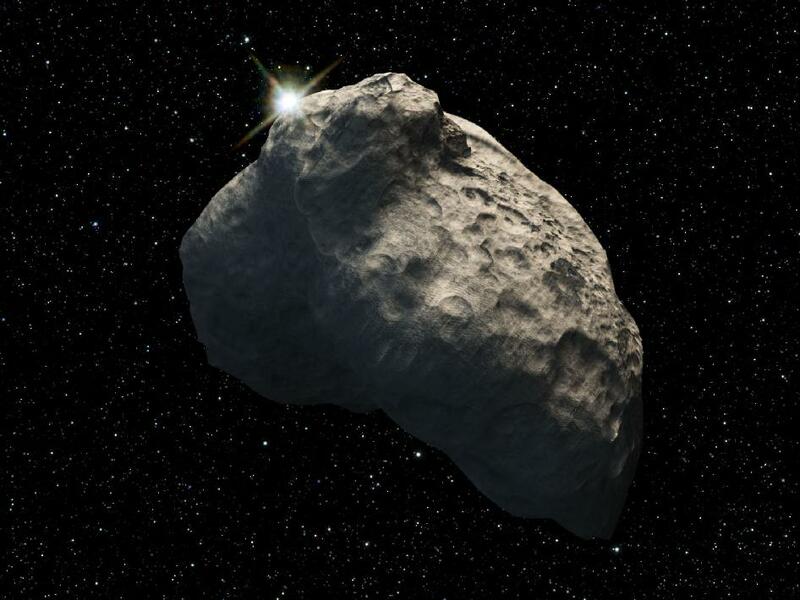 It has taken a long time, but after over a century of debating astronomers are getting rather comfortable with the idea that our Moon formed as the result of an impact between our Earth and the hypothesized protoplanet Theia roughly 50 million years after the formation of our solar system. Evidence for this type of scenario comes from Moon rocks which show oxygen isotope ratios nearly identical to Earth and its lack of a very substantial iron core. If such an event occurred, it would have scattered debris into orbit around the scorched Earth and would have begun self gravitating to form our Moon. But what if, on its way to becoming the romantic companion that hangs in the sky to this day, our Moon was just one of two major bodies to form from that titanic collision? Collision sequence between the Moon and a companion moon. In a recently published Nature letter, astronomers ponder the possibility of seeing evidence that another moon of Earth may have existed for a brief time. The balancing act of maintaining a terrestrial multiple-moon system is known to be extremely unstable on short timescales (<10,000 years). However, there are places like the Earth-Moon Lagrangian points and a few resonance orbits which could trap additional companions for longer. So why the need to invoke this second moon? Well, one mystery that remains about our Moon is the difference in terrain between the hemispheres. The near side of the Moon is low, flat, and dominated by maria (the “seas”) and formed by volcanic flows. Hidden from view here on Earth, the far side is mountainous and heavily cratered. It could be that these differences arose from a very slow speed impact from another, slightly smaller moon. The fun part comes in modeling this type of event. The authors use a smooth particle hydrodynamics code to simulate this kind of predicted collision. In the simulation, the companion moon has a similar composition to our Moon since it would have formed from the same protolunar disk. However, the modeled companion does not contain an iron core. 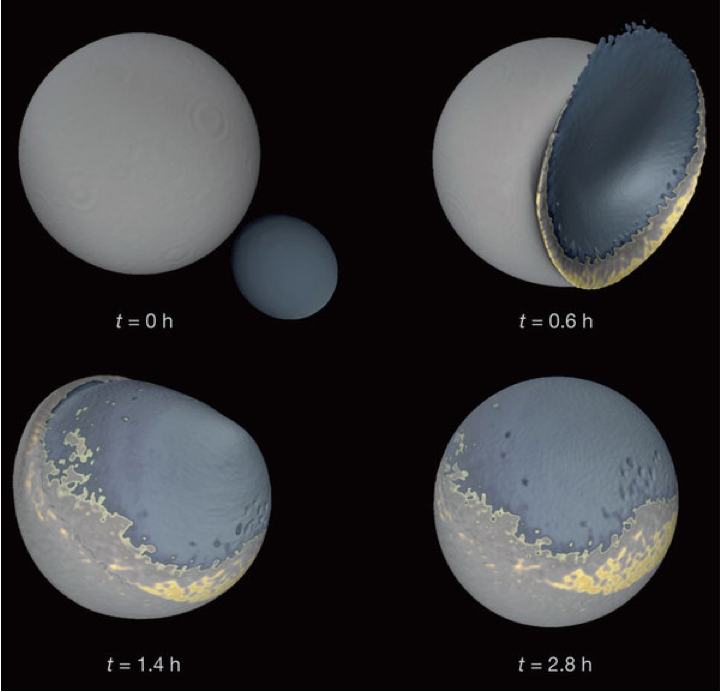 While the collisions are similar to the ones used in the Moon-forming giant impact, the velocities involved are much smaller and mass ratio vastly different. Check out the Letter for an in-depth view of the specifications of their simulation. Their primary finding is that if a companion moon of ~1/3 the diameter of the Moon impacted at a subsonic velocity, an accretionary pile rather than a crater would form, displacing the hypothesised Lunar magma ocean. The final layout would look very similar to what we see today. The model predicts that the smaller impactor would have an older crust due to a more rapid solidifying period. Therefore, two different ages for lunar crustal rocks would be evidence for such an event! An opposing theory is that the lunar dichotomy of terrains may have developed through internal processes such as spatial variations in tidal heating, asymmetric convective processes, or asymmetric crystallization of the magma ocean. These types of processes are supported by the fact that our Moon is tidally locked, and the features line up with the orbit axis. We know the tides must have had an effect on the Moon if it was ever molten, and these features could be the result of that. This exciting new theory offers an alternative that will surely stir up chatter in the planetary science field. 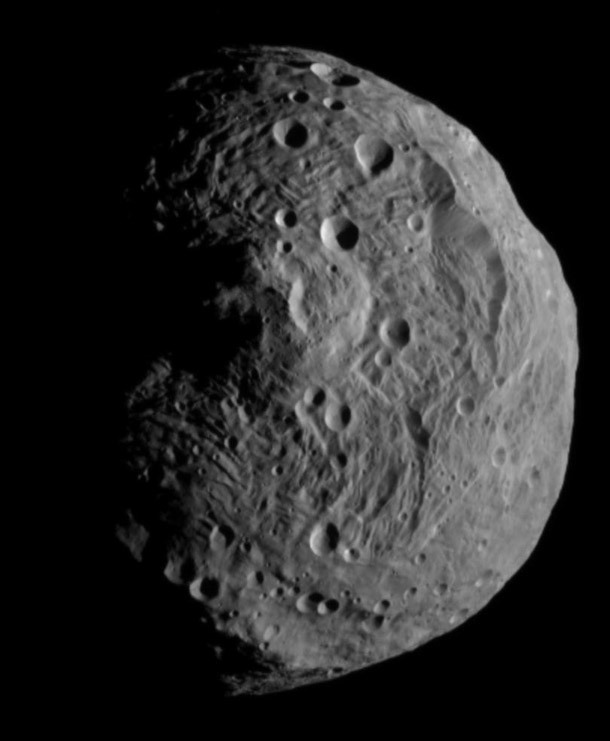 Vesta: The Last Remaining Planetary Embryo 14 New Kuiper Belt Objects in the Southern Sky A Cosmic Vanishing Act Are Carbon-Rich Planets Just an Observational Bias?